Entomologists at Texas A&M University have found a receptor on the legs of mosquitoes that, when activated, causes female mosquitoes to reject sugar as a meal. If the same aversion could be tied to a blood meal, researchers say, a totally new and effective mosquito feeding deterrent may be in the offing, one that could cause the mosquito to pass up the required blood meal needed to lay eggs. Doing so could either disrupt the mosquito’s life cycle or reduce disease transmission, they said. The discovery is the work of Patricia Pietrantonio, a professor and Texas A&M AgriLife Research Fellow in the Department of Entomology, College of Agriculture and Life Sciences, along with her students and colleagues from other institutions. Pietrantonio recently published the research in the Proceedings of the National Academy of Sciences. After mating, female mosquitos immediately search for a blood meal from a human host, Pietrantonio said. The blood meal supplies the protein source female mosquitoes require to produce eggs, she said. If blood is not available, females will feed on sucrose solutions such as nectar from flowers. 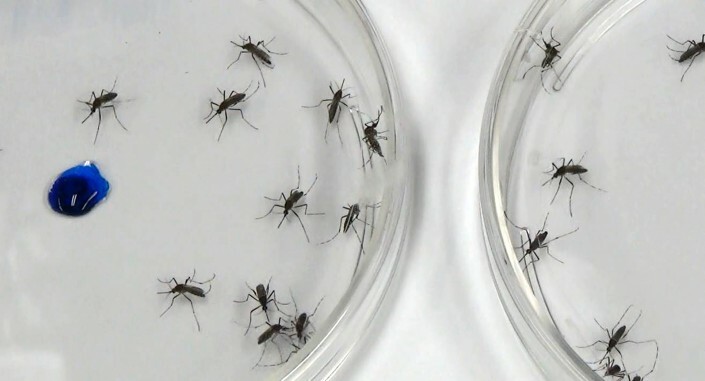 The researchers found that a synthetic peptide causes mosquitos to fly away, walk away or jump away from a sugar meal. They now hope to use their discovery find a similar deterrent for blood meals.